Wabi-Sabi: Where's Gene Garber when you need him? Where's Gene Garber when you need him? My beloved Braves open a four-game series vs. the Giants on Monday, and Barry Bonds needs only 2 more Home Runs to tie and 3 to break former Brave, Hammerin' Hank Aaron's all-time Home Run record of 755 career HRs. I'm sure the crowd will be "juiced" for the match-up, especially when John Smoltz takes the mound against Bonds Monday night. 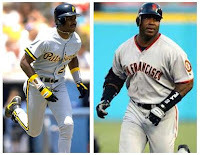 Personally, I'm hoping that Bonds will have as much success in this series as he did when his head was 2 or 3 sizes smaller and he was a skinny all-star outfielder for the Pirates playing against the Braves in the 1991 and 1992 National League Championship series. I'm sure that a player like Smoltz is savoring the opportunity to go right after Bonds, but I have to admit that I keep wondering, where is former Brave pitcher, Gene Garber, when you really need him? As true Braves fans will recall, Garber knew how to take care of would-be record-breaking arrogant players with questionable character issues. I would love to see a repeat performance versus Mr. Bonds this week.